I just have to share this story. The other day I told it to my friend, Carol, which caused her to burst out loud with laughter. 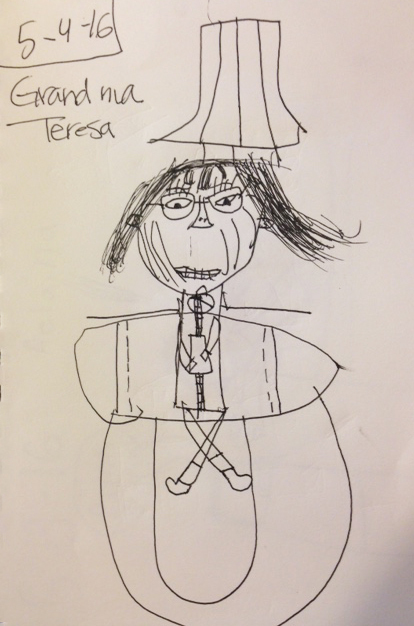 Last week my 61/2 years old GRANDdaughter got out her sketch book and proceeded to draw me. I was smitten to watch, from the corner of my eye, while she looked at me then drew a little, then looked at me again and drew some more. My heart was melting with pure love and connection in that moment. I was smiling from ear to ear. Several times I had to focus on my breathing to prevent tears from flowing down my cheeks, I was that moved. She told me not to look because she wanted it to be a surprise. She continued to draw. A short while later she was finished and proudly exclaimed.... "Here you go, Grandma!" My jaws ached from smiling so big!!! We talked about the picture. Delaina began to tell me what everything was and I could even visualize her concept. I'm sitting on a loveseat with my legs crossed. There is a lamp behind me (not a floating hat). She gave me longer hair just to see what I would look like. OK - I get all that. I asked her what the lines were on my face and she said, "Those are the ones that you have when you smile". What?? I maintained my loving GRANDma composure while my inner critic was gleefully jumping up and down with joy that I was just told I had big lines on my face. I politely excused myself to the bathroom with the intention of confirming that this was a false speculation. Can you imagine my dismay when I smiled into the mirror and I actually saw those same lines? I was floored!! I had no idea!! Fast forward...when I got home that evening I looked into the mirror and smiled again. Damn...those lines were still there. I was taken back by the way those lines were impacting my esteem. I stood in front of the mirror trying to find a way to smile that wouldn't show those lines. There was none. It was then I realized I was at a crossroads. I could let those smiles lines bother me enough that it would affect my inner joy and I would stop smiling "from my heart" OR I could embrace them. It didn't take me long to put it all in perspective. They are only lines, that's all. I am going to continue to smile! I, now, see them as quotation marks, to mark the beginning and end of a smile from my heart!